The secret mythological firebird has risen! 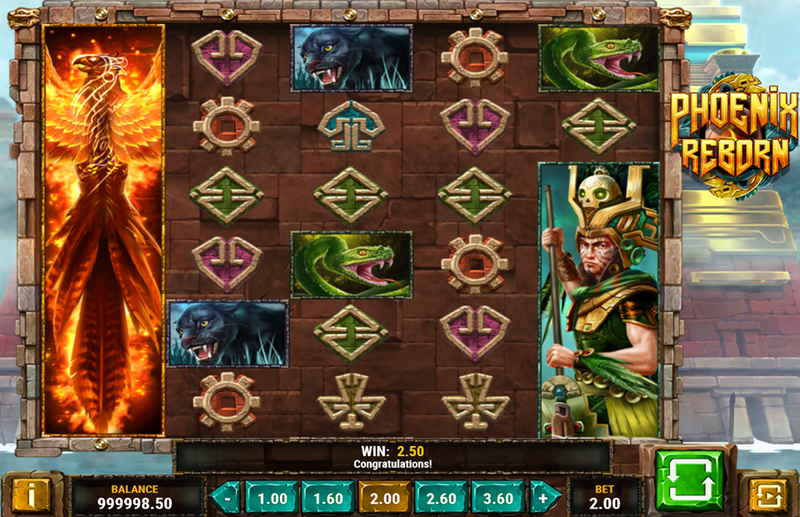 Inspired by glorious Aztec civilization, Play’n Go created a challenging and rewarding video slot machine with 5 reels, 3 rows, and 40 paylines. Featuring Wilds, Expanding Wilds, Scatters, and re-triggerable Free Spins, Phoenix Reborn introduces Phoenix Flames and Rise of the Phoenix bonuses leading to the big win of 5000x your stake. Tempted to find more details? Read the Phoenix Reborn slot review. Tired of reading? See the Phoenix Reborn screenshots below and then claim one of the bonus offers of our recommended casinos to play for free or real! Set in the scenery of a well-guarded temple jam-packed with sacred items of the entire nation, this is a game you can play for fun or for cash, depending on your choice and experience. In both modes, the book of rules remains intact, meaning you need to line up 3 or more symbols of the same kind on adjacent reels and receive a prize according to the paytable. The only difference between the Phoenix Reborn Free Play and real-money modes is the fact the first case scenario pays in demo credits but makes a fine way for players who want to learn how to win and make no investment at all. Before entering the holy land, you’ll be asked to set the coin value ranges from €0.20 and €100, so act to your specific betting strategy. The choice also affects amounts of potential prizes. For example, while betting at the highest level, 2, 3, 4 or 5 Wilds pay 10, 75, 375 or 2.500 coins, respectively. Both male and female Aztec Warriors act as Expanding Wild and may fill any given reel to help you form more winning combinations – courtesy of the Phoenix Flames mode. Still, beautiful yet deadly female pays up to 1.000 coins, while her less attractive and equally dangerous accolade brings a maximum of 750 coins for 5 of a kind. Other themed symbols grant 25 to 375 coins, depending on their payout rating. Naturally, Wild can replace all paying icons but has nothing to do with the Scatter. The last-mentioned is what you’ll need to activate the Phoenix Reborn Bonus games. Once 3, 4 or 5 Scatters land anywhere on the reels, you will receive an initial batch of 7, 12 or 20 Phoenix Reborn Free Spins, respectively. On a random occasion during this feature, the Expanded Wild will cover an entire reel on every single spin. Moreover, Rise of the Phoenix grants up to 4 Wilds spread around the base to improve your winning odds. With 2+ Scatters, players will be rewarded with an additional set of a maximum of 20 extra spins. 3. What is the RTP factor of Phoenix Reborn? According to the official info, the default RTP stands at 96.50%, so our Phoenix Reborn recension sticks to that figure. Since every new spin is a chance to earn a prize, we recommend this game to players of all experience levels. You will find a variety of betting options, re-triggerable free spins and all-involving Wilds, while the Phoenix Reborn tips will help you try bringing the temple down.